Print Book 518 pages in 1 volume (printed book) with downloadable forms Note: For print books, with MCLE's supplementation service, new supplements and revisions are mailed automatically with an invoice. If you do not want to subscribe, please check the opt out option during checkout. A comprehensive guide to the complex and fast-changing areas of adoption and reproductive technology law. Practical, step-by-step treatment of each topic guides practitioners through procedures such as consents to adoption, petitions to dispense with consent of a birth parent, determinations of parentage, petitions for adoption and agreements for gamete donation or surrogacy. updated judicial commentary and court forms. 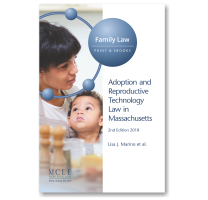 We trust you will find this edition of Adoption and Reproductive Technology Law in Massachusetts an invaluable resource for your practice. Kathleen A. DeLisle, Esq., Nichols & Delisle, P.C.